How do we prioritise our new features and improvements? There are thousands of nurseries and pre-schools across the UK using Connect Childcare. After 14 years working alongside them, we are well aware that each childcare setting is unique, operates in their own way and has their own requirements. So how do we make sure we’re developing the features that all of our users can benefit from? We ask you of course! 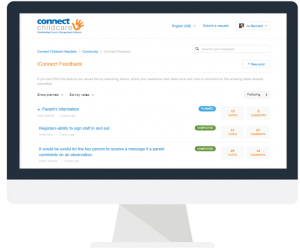 Our Connect Community platform allows Connect Childcare users to post their ideas for new features or improvements to our software. All of the posts are available to browse or search, and when other users agree with an idea, they can vote for it and add their own comments. Our product team can then see just how many of our users want a certain feature which helps them to prioritise the hundreds of requests we have. They can respond directly to the posts and comments, and once they know we’re going to work on a request, they mark it as planned and then completed. Are you making sure your voice is heard? Log onto the Community today to post your ideas and vote for other’s ideas. If you don’t already have a login, email our team at support@theconnectgroup.net to get yourself signed up.